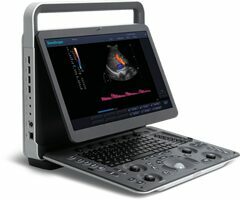 Delivering Premium Solutions Color doppler middle class hcu with 15.6" high resolution monitor and 3 transducer socket. 64 phys. channels, 7 imaging levels, compatible to HD probes and latest generation probes, convertible monitor, built-in battery. Light-weight and compact. Classical keyboard panel. SonoScape's E3, as a new hand carried color doppler ultrasound model, is equipped with complete functions which enhances its competitiveness to entry level ultrasound models. lt not only provides satisfying image quality but also brings users a smooth workflow experience.